For this month’s Home Spotlight we are featuring the Riverfront Reflections, where you can experience luxury living at an affordable cost. The House: This absolutely stunning property is what dreams are made of and is totally fitting for those who love the best things in life. 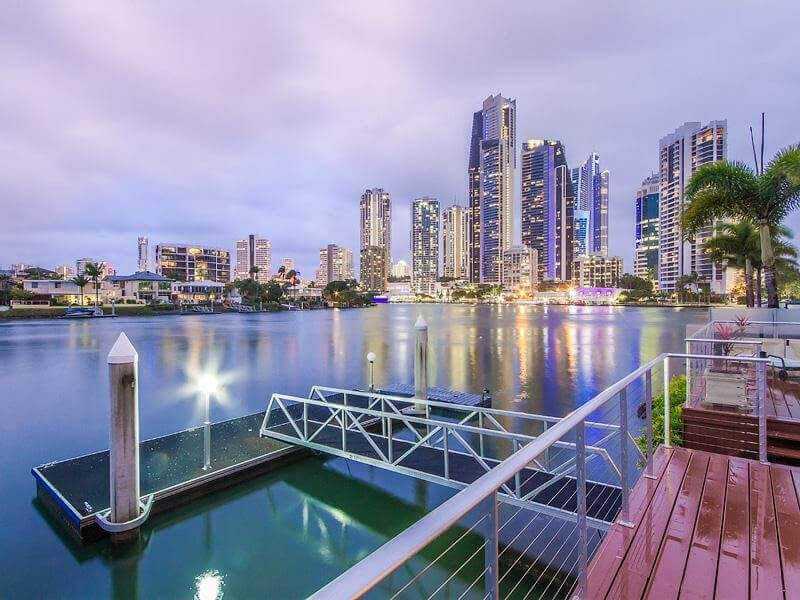 This magnificent villa has the lot from the heated waterfront pool which allows you to luxuriate on the outdoor deck while soaking in the breathtaking Surfers Paradise skyline views to the air-conditioned modern accommodation. The Location: This luxurious villa is perfectly positioned between various quality restaurants, newly refurbished Pacific Fair, Marina Mirage boutiques as well as the countless shops at Surfers Paradise. The glorious beaches are located close by and the hinterland is just a short drive away. The Living: This architecturally designed residence takes full advantage of the wide North to main river position with a private plunge pool, spectacular city skyline views and fabulous indoor/outdoor entertaining. This home is ideal for families and friends with multiple open plan living, dining and entertaining spaces with large floor to ceiling sliding doors and windows that seamlessly creates an impression of space, style and quality. The Entertaining: The stylish open plan kitchen has quality stone benchtops and Miele appliances, including induction cooking, it also enjoys water views. The home has waterfront balconies and a jetty so you can be picked up directly from this home for a cruise on our waterways. This home provides you with resort style year round indoor/outdoor entertaining. The Bedrooms: The master bedroom is on the first floor with water views and an ensuite. There are three other bedrooms, one with an ensuite and two others sharing the main bathroom.